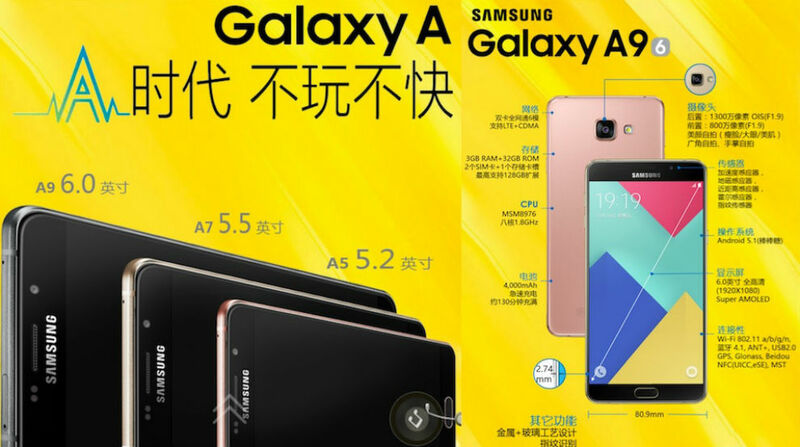 Samsung has a new device for the smartphone market in China, the Galaxy A9, part of the Galaxy A family. Set to release in China later this month, the phone features a premium exterior of glass and metal, much like we have on the Galaxy Note 5 and Galaxy S6 here in the US. One major difference, though, is the Galaxy A9’s larger 6″ Super AMOLED display, as well as a 4,000mAh battery. Other specs include a Snapdragon 652 octa-core processor, 3GB of RAM, 13MP rear-facing camera, 8MP front-facing camera, 32GB of storage, microSD cart slot support for up to 128GB of storage, and will run Android 5.1 upon release. As we have seen on recent Galaxy devices, the Home button on the frontside of the device will double as a fingerprint reader, and in addition, the device will launch with Samsung Pay compatibility. At this time, it is unknown whether Samsung intends to offer this device in markets outside of China. Maybe we will learn more at CES, though.